Pure, simple, and uncomplicated. 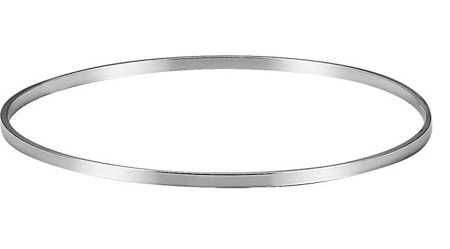 A plain, polished 2.25mm wide sterling silver slip-on bangle bracelet for women made in solid .925 sterling silver. Bangle is a standard 7" size. Wear it by itself or as a set of 3, 5, or 7 to create a traditional 7-day silver bangle and get a discount for purchasing more than one! Each bangle weighs approx. 5.61 grams of sterling silver. This is no flimsy, paperweight bangle, but is a quality fine jewelry piece. Also available in a wider 4.75mm width (shown below). Includes free shipping on every order to the U.S. (international shipping also available). We guarantee our Plain Sterling Silver Bangle Bracelet (2.25mm) to be high quality, authentic jewelry, as described above.